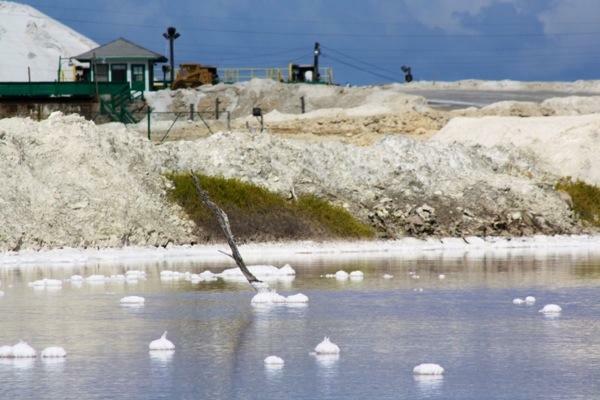 At the beginning of our Bahamas safari our guide Henry drove us past the Morton salt company’s salt ponds. They stretched as far as the eye could see and looked more like an inland sea than any “pond” I’ve ever seen. 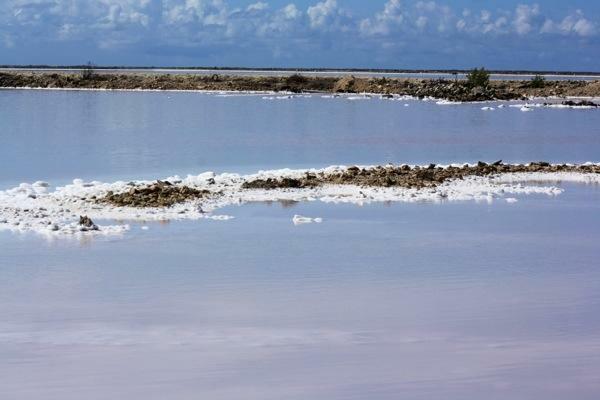 He told us that our loop would bring us back past the salt ponds later on and we could see how the operation works. As we approached the salt factory towards the end of our loop we could see how the ponds were connected together. The process starts with a pumping station located near the lighthouse. Here there is a huge pump that lifts seawater up into a canal. 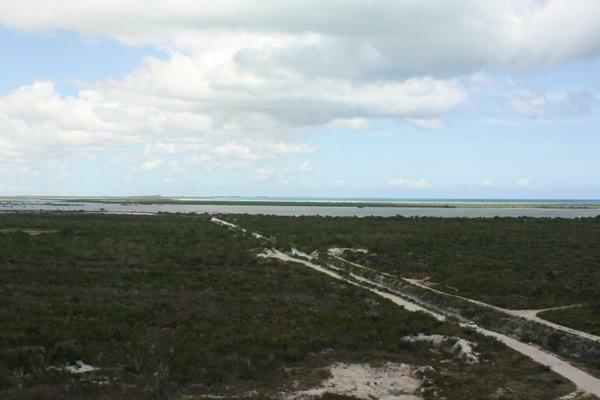 The canal runs to the middle of Great Inagua and deposits the fresh seawater into a HUGE reservoir. 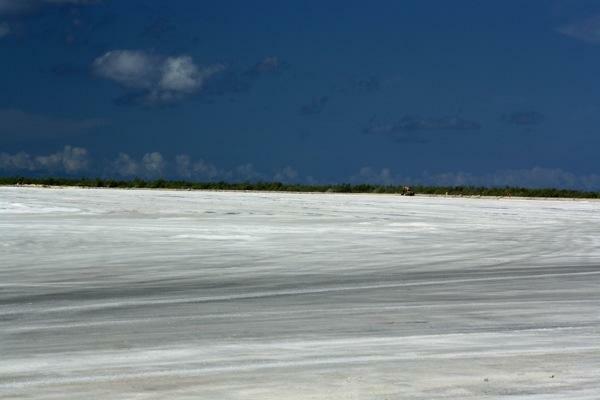 Once here the saltwater is heated gradually by the sun. 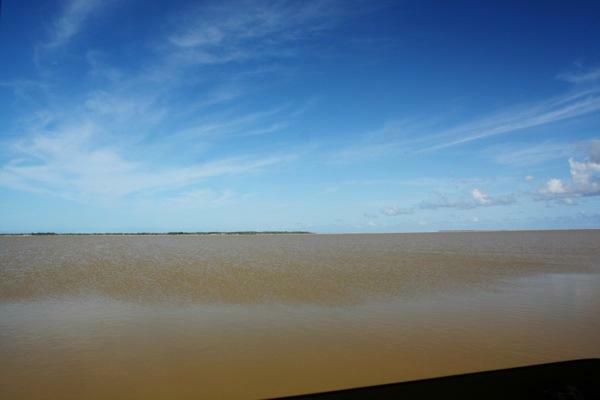 From this reservoir the salt water is a allowed to flow into the initial salt ponds. These ponds are very shallow and allow the sun to really start evaporating water. Using a series of gates the water is channelled from pond to pond. Since the water keeps evaporating each pond has a higher concentration of brine. Long before the final ponds the salt starts to crystallize out on rocks, sticks or anything else in the pond. 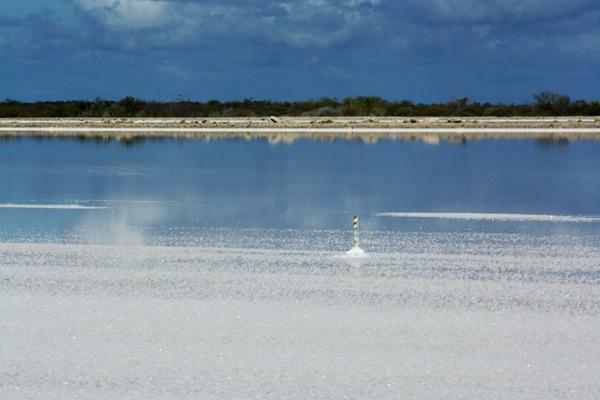 There are markers in the pond to show how deep the salt has accumulated in the later ponds. 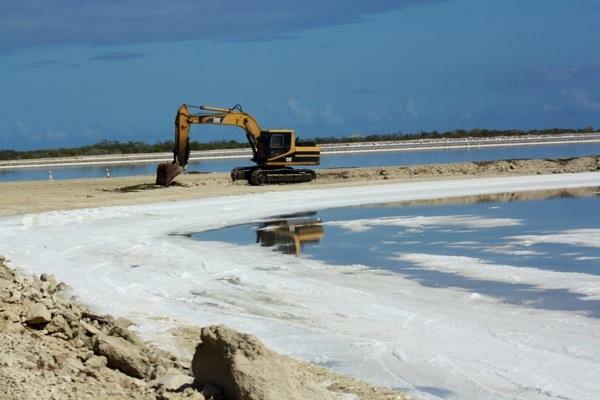 Henry told us that in the final harvesting ponds the salt will be at least 6 inches thick when they allow the pond to finally dry out. This enormous amount of salt is then scooped out using heavy machinery and piled high near the loading dock. We weren’t fortunate enough to see a ship being loaded, but we were told that a ship comes every 8 days and takes away 6000 tons of salt! The loading dock certainly looked capable of moving a lot of salt into a ship very quickly. 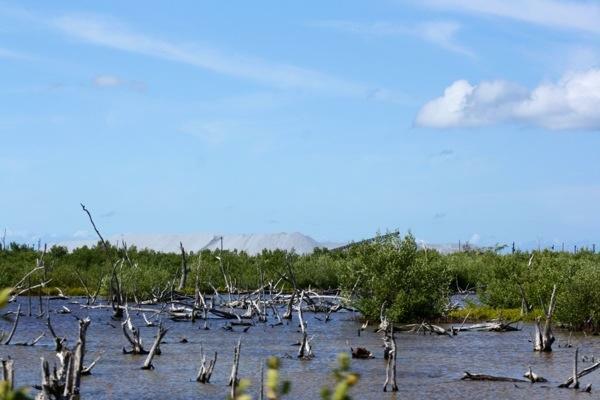 Even as we headed back towards Matthew town the piles of salt loomed on the horizon as the tallest “mountains” on Great Inagua. 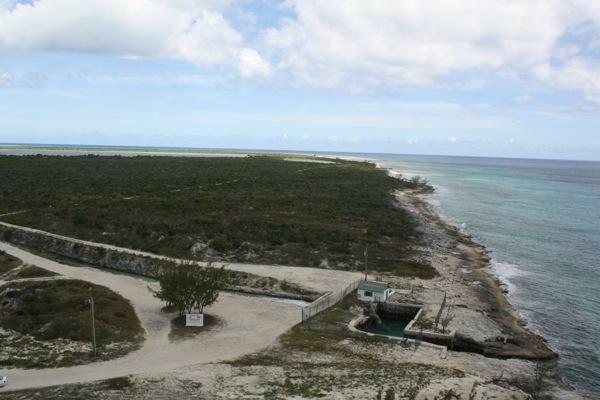 This entry was posted in Uncategorized and tagged bahamas, great inagua, Land Exploration, Morton, Salt by Brian. Bookmark the permalink. that is amazing! Did you get to Diamond Crystal beach-way south on LI? It was in business for yrs on the island over 30 yrs ago….but 2 years of too much rain-freshwater- put them out of business and one day they just came in and said GO HOME….left everything there….like a ghost town! do you see my replies????? 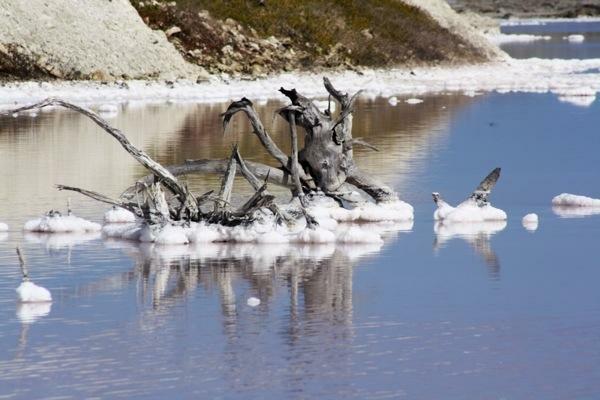 Photos remind me of Mono Lake in CA. 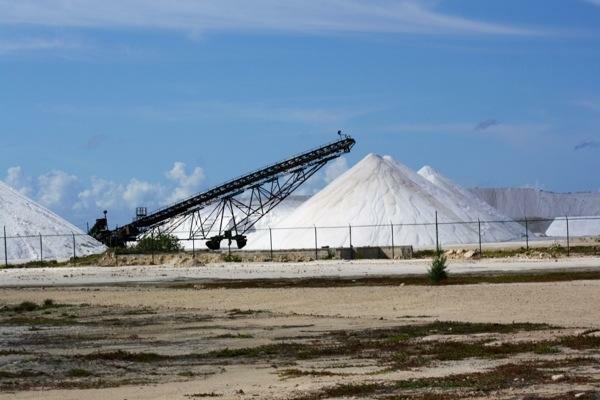 When I was on Great Inagua, they told me that the Morton ship dropped off all the potable water for the island and picked up the salt. I wonder if that is still true? PS Brian, us Laser guys miss you. I hope your Laser season is off to a great start! 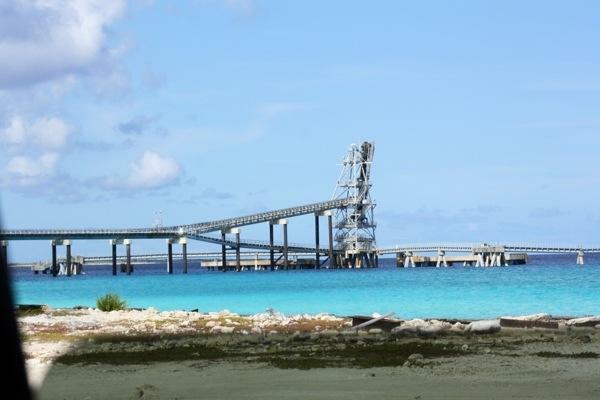 We aren’t sure if the Morton ship brings in the potable water or not, but the locals told us that they can get just about anything brought in on the company ship. It makes it much much easier for them to have a regular supply ship from the states.